Linpus Linux is a Fedora based operating system created by the Taiwanese firm Linpus Technologies Inc. Linpus was designed specifically to fully support the Asian market, with full Unicode support for the Chinese and Japanese Language. A special version Linpus Lite, was written to run on devices with lower cost hardware such as Netbooks. 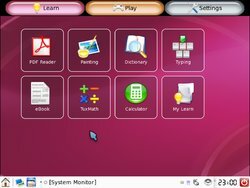 It has both an icon and tab-based \"Simple mode\", designed for new users; and, a conventional style \"PC mode\" for those wanting a more Microsoft Windows-like interface. It is targeted at handheld devices with smaller screens, and supports resolutions as low as VGA(640x480). The Acer Aspire One, Northtec Gecko and AIRIS KIRA Series netbooks come with Linpus Lite Linux pre-installed. A version for normal desktop computers and servers is also available, as well as a Multimedia version called Linpus Media Center. The Media Center version offers an \"Upgrade pack\" to legally use DVD,MP3, WMV and other non-free codecs.